When Carl Icahn came knocking, AIG didn't listen. That's a recipe for a fight. Last week, American International Group (NYSE:AIG) announced a plan to spin off 20% of its mortgage insurance business in an IPO, with plans to sell the remaining 80% over time in the future. The company will also sell its financial advisory business and will reorganize the remaining divisions of the company into nine operating units. This announcement came after activist investors, led by Carl Icahn, began calling for the breakup of AIG last year. Icahn and others think that a smaller, more focused AIG would be more efficient and command a higher valuation than the conglomerate as it exists today. AIG's announcement falls well short of Icahn's demands, setting the stage for the battle to only intensify in 2016. The driver behind the activist interest in AIG and other insurers is the Fed's inclusion of several non-bank insurance companies on the list of so-called systemically important financial institutions, or SiFis. SiFi institutions face considerable regulatory oversight, including higher capital requirements that protect the companies from a repeat of the financial crisis but also reduce their earnings potential. While the vast majority of SiFis are banks, a few non-banks made the list thanks to their large size or interconnectedness within the financial system. AIG fits squarely into both of these categorizations. Icahn has pushed AIG and others to dramatically shrink their size enough to shed the SiFi designation, and thus avoid the higher regulatory and capital burden. Instead of the relatively small changes announced by AIG's management last week, Icahn is pushing for the company to split into thirds, separating its life insurance business, mortgage business, and property and casualty business into three separate companies. The announcement in January starts the process of selling the mortgage business, but is still far less aggressive than what Icahn believes is necessary. He's said that the company today is "too big to succeed," a play on words from the common "too big to fail" refrain in political and policy discussions following the financial crisis. AIG is not alone facing these pressures. Earlier in the month, MetLife announced it would sell its retail life and annuity business, a transaction that could shrink the parent company by more than 28% in a single transaction. The goal of the sale, not surprisingly, is to end the company's designation as systemically important. General Electric, another non-bank systemically important financial institution, was the first to take aggressive steps to reduce its financial exposure and work to drop the SiFi label. GE has sold, and is continuing to sell, billions of assets from its formerly powerful GE Capital division, transforming the entire enterprise away from finance and toward a focus on energy and industrial businesses. Many analysts viewed the move by CEO Jeffrey Immelt as a proactive step to reduce risk, but also as a measure to keep activist investors at bay. For AIG, the shrinking process has been well under way for over five years now. After accepting a $184 billion bailout during the financial crisis, AIG has sold off businesses, simplified its business model, and lowered its risk profile. 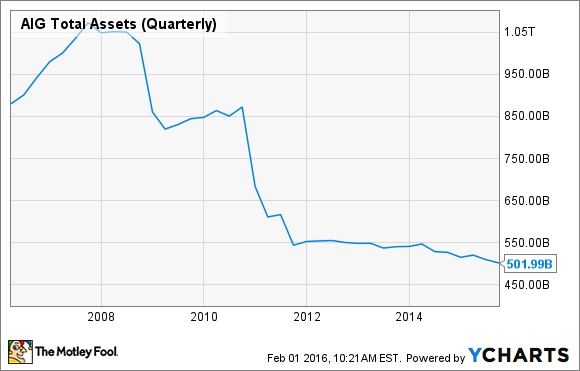 Since reaching its peak size in late 2007, AIG has shrunk its total assets by over 53%. Despite that considerable progess, Icahn thinks the company should do even more. In his view, the job won't be done until AIG can rid itself of the regulatory burden of being systemically important. Where does AIG go from here? CEO Peter Hancock has been consistent in statements to investors since Icahn entered the picture. He and board chairman Douglas Steenland have repeated their willingness to listen to the desires of the company's investors and have left open the option for further sales. Hancock went as far as to say that there "are no sacred cows." However, Hancock in particular held steadfast that attacking the SiFi designation is the wrong strategic priority for the company to focus on right now. The company estimates that the SiFi designation costs somewhere in the ballpark of $130 million per year in additional costs, however, the company benefits from a $1.3 billion tax benefit by keeping its life insurance and property and causality businesses together under one roof. Based on Hancock's sentiment, the organizational restructure announced last month, and the company's history over the past five years, it seems plausible that further divestments are in the works, but nothing to approach Icahn's aggressive plan. That puts the ball back in Icahn's court, a place that often leads to proxy fights, changing board seats, and sometimes even new management entirely. What happens next is hard to predict, but with Icahn in the picture, 2016 is shaping up to be an interesting time for AIG and its shareholders.